Our fellow circuit benders on the East Coast Burnkit2600 will be performing at the closing party for Miru Kim’s Naked City Spleen exhibit at Gestarc Gallery in Red Hook. The work is part of Kim’s ongoing series of photographs that depict her nakedly exploring abandoned subway stations, tunnels, sewers, and even the now-demolished sugar refinery in Red Hook. Justin, Thom, and Brett Marshall Lefferts ( from Seed A.I. ) will attempt to tame a wild menagerie of exotic 8-bit devices and unruly circuit bent machines live on stage. 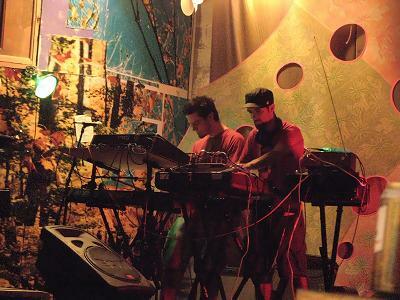 The result will be their signature blend of electro-pop/noise/freeform electronic music, a synthesized symphony of sound waves sure to assault all six senses. No prepared material, experimental improvisation with: 2 Commodore 64s (Cynthcart), Nanoloop, LSDJ, MIDINES, Synsonics Drum Toy, Circuit Bent Touch’n’Tell, Looper, EFX. Location: Gestarc Gallery – Brooklyn, New York Music starts at 10:00pm – Probably Free. In other news: Burnkit2600 is working on an NEW album which will be download-able via a Pay-What-You-Will scheme and an 8/8/08 show at DCTV in NYC is also planned.